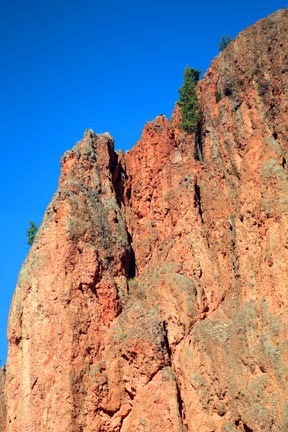 These distinctive red cliffs near Radium Hot Springs are rich in iron. Kootenay National Park lies on the western side of the Continental Divide, straddling the Main and Western ranges of the Canadian Rockies. As elsewhere in the Canadian Rockies, the geology of the park is complex. Over the last 70 million years, these mountains have been pushed upward—folded and faulted along the way—by massive forces deep beneath the earth’s surface. They’ve also been subject to erosion that entire time, particularly during the ice ages, when glaciers carved U-shaped valleys and high cirques into the landscape. These features, along with glacial lakes and the remnants of the glaciers themselves, are readily visible in the park today. The park protects the upper headwaters of the Vermilion and Kootenay Rivers, which drain into the Columbia River south of the park. If you drive through Kootenay National Park in August, it’s impossible to miss bright pink fireweed, which carpets entire mountainsides that have been affected by wildfire. 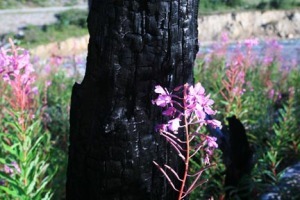 Fireweed is common throughout the Vermilion Valley. species such as willow and heather predominate. For a short period each summer, these elevations come alive with color as forget-me-nots, avens, and avalanche lilies flower. Of special interest is the interpretive trail through Vermilion Pass Burn, where fire destroyed 2,400 hectares (5,930 acres) of forest in 1968. Lodgepole pine is the dominant species here. The area affected by the more recent wildfires is an excellent place to see the natural regeneration process at work. Large mammals tend to remain in the Kootenay and Vermilion River Valleys, making them relatively common sights along Highway 93. White-tailed deer, mule deer, moose, black bears, and elk live year-round at these lower elevations, as do bighorn sheep, which can be seen at mineral licks along Highway 93 and in the vicinity of Radium Hot Springs. The most common large mammal present in Kootenay is the mountain goat, but these flighty creatures stay at high elevations, feeding in alpine meadows throughout summer. Grizzly bears number around 10 within the park; they range throughout the backcountry and occasionally are sighted in spring high on roadside avalanche slopes. Although no wolf packs call the park home, lone wolves are occasionally spotted along Highway 93 between Kootenay and Vermilion Crossings.